What Are Subungual Hematoma Symptoms and Signs? How Do Medical Professionals Diagnose a Subungual Hematoma? What Are Subungual Hematoma Home Remedies? What Are Treatment Options for a Subungual Hematoma? Is It Possible to Prevent a Subungual Hematoma? What Is the Prognosis for a Subungual Hematoma? A subungual hematoma is a collection of blood in the space between the nail bed and fingernail or toenail. Subungual hematomas result from a direct injury to the blood vessels under the fingernail or toenail. The pressure generated by this collection of blood under the nail causes intense pain. Subungual hematoma is a common type of fingertip injury. Subungual hematomas most commonly form after a crush injury to the tip of the finger or toe. Blood underneath a fingernail or toenail is a subungual hematoma. 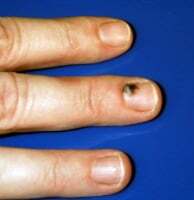 You will have a discoloration of red, maroon, blue-black, or other dark color beneath the nail after an injury. The most common symptom is intense pain. Pressure generated between the nail and the nail bed, where the blood collects, causes this pain. The pain may also be caused by other injuries such as a tuft fracture (break) to the underlying bone, a cut in the nail bed, or bruising to the finger or toe itself. If the pain is mild and the hematoma (blood collection) is less than 25% of the area under the nail, then home care can be considered. If the hematoma is 50% or more of the underlying nail area, then medical attention is required. If the injury that causes the subungual hematoma is severe enough to cause intense pain and tenderness, seek medical attention. The mechanism of injury for this condition can cause a fracture to the bone at the end of the finger (distal phalanx fracture) or toe or a laceration to the nail bed under the nail that may require further medical attention or nail removal. A health care professional may take an X-ray to look for a fracture (break) to the underlying bone. X-rays do not provide any information regarding the bleeding or hematoma formation underneath the nail. Depending on the type of injury and the degree of the injury and how much blood forms under the nail, the doctor may decide to remove the nail to check the nail bed for lacerations (cuts). While it used to be customary to have the nail removed to examine the nail bed for lacerations or injuries, this is no longer routine practice if the nail edges or margins are intact. Ice, elevation (keeping your arm or leg above the level of your heart), and over-the-counter (OTC) pain medications are recommended for minor hematomas. Wrap ice in a towel and do not apply ice directly to skin. A bag of frozen vegetables (corn or peas) wrapped in a towel works well. 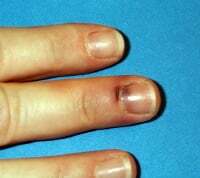 If the hematoma involves more than 50% of the area of the nail, seek medical attention. If the nail was removed by the injury and the nail bed wasn't cut, the following home treatment is recommended until the nail bed begins to be less sensitive, usually in seven to 10 days. After soaks, apply over-the-counter antibiotic ointment and a dry, sterile bandage (Band-Aid). There are several techniques to drain the blood beneath the nail. Nail trephination or releasing the hematoma are other names for this procedure. Occasionally, a physician will numb the finger or toe with a digital block . (Your fingers and toes are called digits.) Some doctors (health care professionals) opt not to numb up the digits as the injection itself can cause as much if not more pain than the actual drainage of the hematoma. A medical professional will inject numbing medication such as lidocaine is injected at the bottom of your finger or toe. Electrocautery: A battery-operated device burns a hole in the nail until the blood is reached and drains out of the hole. This technique should not be used if the patient is wearing artificial acrylic nails which might be flammable. Needle: A large diameter needle (such as an 18-guage needle) is used to drill or bore into the nail to create a hole to allow the blood to drain out. Paper clip cautery: Some practitioners still use this technique, although an older one. A paper clip is opened so that the pointed end is free. Then the pointed end is heated up, usually by passing it through a flame, and used to burn through the nail. This technique uses a combination of the cautery method and the needle method. After the subungual hematoma has been drained, follow-up is usually not necessary. Antibiotics are not routinely needed after a subungual hematoma is drained, as infections are uncommon. If the nail was removed and a cut in the nail bed was stitched closed, you should see your doctor in 48-72 hours for re-examination. Usually, the type of sutures (stitches) placed will dissolve, so removal is not needed. If non-dissolvable sutures (nylon) are placed in a nail bed laceration, they need to be removed in about seven days in the emergency department or by your doctor. Close monitoring is still recommended. If there is a splint over the injury, keep it clean and dry. Use common sense and practice other safety-minded actions to prevent getting your fingers slammed in doors or dropping heavy objects on your toes. Steel-toed shoes are important safety equipment to wear on certain high-risk jobs such as construction. Watch children's hands as you open and close car doors. Give your full attention to the task at hand. Finger injuries often happen when the person using the tool is distracted. Don't lift something you cannot handle alone. Find people to help you carry heavy objects to avoid dropping them on your toes. After the subungual hematoma is drained, the pressure beneath the nail is relieved, and the pain decreases significantly. The hole formed in the nail will remain and grow out at the rate that the nail normally grows. One possible risk and long-term complication of a subungual hematoma is a nail bed laceration (cut). If trauma is severe (for example, an subungual hematoma of the surrounding soft tissue including the nail bed, lunula, nail plate, or nail matrix), the nail bed laceration can be stitched closed after the nail is partially or completely removed. If the skin beneath the nail is lacerated, similar to any other skin cut, it may not heal properly without nail bed repair. This complication can result in deformity of the new nail and the nail growth. The deformity may be temporary and go away after the nail grows out, or it may be permanent, and you may have an obviously deformed nail forever. If you do not seek medical attention at all for a subungual hematoma (not recommended), and sometimes even if you do, and a significant injury occurs under the nail, the nail may completely fall off as it grows out as part of the natural healing process. Despite best efforts by doctors and yourself at home, nail deformity and permanent abnormalities can result from such injuries. A thumb after it was hit with a large hammer. Notice that the dark discoloration beneath the nail takes up more than 75% of the area. This is blood. This hematoma required drainage to relieve the pressure. The battery-operated cautery unit and its tip when it is activated. Notice the red hot area used to burn the hole in the nail. The process of burning a hole in the nail to relieve the hematoma. Notice the blood draining from the hole after the hole was formed with the cautery unit's hot tip. The finger has been numbed prior to this procedure. The same thumb after it has been drained. Notice the hole in the nail and the blood draining from the hole. The large dark area beneath the nail (the hematoma) is practically gone. 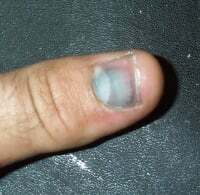 An example of a nail with a subungual hematoma that occupies less than 25% of the nail area. This hematoma did not require drainage. The same subungual hematoma three-and-one-half weeks after the original injury. 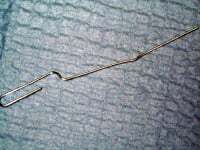 A paperclip opened for use in draining a subungual hematoma. The open end would be heated to allow it to make a hole in the nail. Bope, Edward T., and Rick D. Kellerman. Conn's Current Therapy 2012, 1st Ed. Philadelphia: Elsevier, 2012. Fastle, Rebecca K., and Joan Bothner. "Subungual hematoma." July 5, 2018. <https://www.uptodate.com/contents/subungual-hematoma?search=Subungual%20Hematoma&source=search_result&selectedTitle=1~12&usage_type=default&display_rank=1>. Roberts, James R., and Jerris R. Hedges. Clinical Procedures in Emergency Medicine, 5th Ed. Philadelphia: Saunders, 2009. What caused your bleeding under the nail (subungual hematoma)? What was the treatment for your subungual hematoma?